He does have some really good movies, doesn't he? Wish I lived in England so I could go to Jett's house and get some help with weathering. I do ok. But I'm not on this level. Thanks guys, your support really does mean a lot to me. If it’s anything at all like BRD (black rifle disease) - then there’s no cure. All you can do is hang on tight and enjoy the ride. 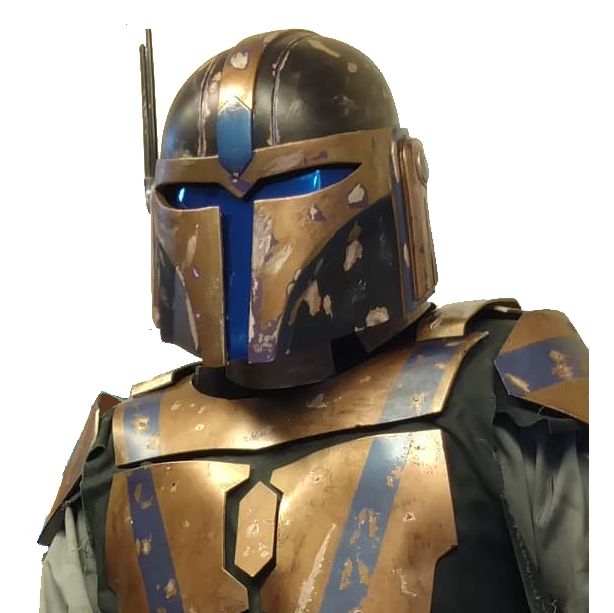 "Mandalorian Assassin- the very best there is... when you absolutely positively gotta kill every motivator in the room, accept no substitutes"
oh no........ i think i'm developing one of those lol "a weapons aquisition dissorder". "More" just isn't enough!!!! $1500 of perdy right there. Lol my wife knows how much my costume stuff costs. Because I tend to be a Diy’er vs spend my money on it. Oh me mrs knows alright, she just thinks i'm a bit touched. now my 5 yr old daughter has started asking when she can have a jet pack.... so i guess i may be scratch building one at some point as well. just out of intrest how many buckets have you made now bow? Scratch build one for your daughter with a grapple hook.....could hang from a tree, instant swing. You do love a grappling hook i may have a go at that. Think i should finish me 2 kits first...... then i'll get to work on mini-me. That’s a touché if I ever heard one! 80+ resin cast helmets, close to 30 pep based, 3 bucket based builds, one hybrid pep/sintra/for sale sign, and a couple 3d printed ones that weren’t Mando. I’m currently got two 3d print ones some folks printed for me that I’m working on finishing. Oh I’m also working on making a modular helmet out of one of my many trades. It’s gonna have a Cody visor that’s seated in some RF stalk earcap bases and will be switchable to the electro binoculars. ........... yeah....... i'm just gonna shut up now.